It's that time of the year again when anyone who cares about giving the adopted the right to own their birth information to get to their keyboards and let legislators know your feelings! We've come a long way since all states but two had sealed up the original birth records of all adopted individuals, but there is still work to be done. Connecticut will have a public hearing tomorrow, March 9, 2018, on a bill that takes care of the adoptees in that state born before October 1,1983. Since 2014 adoptees born after that date had the right to their original birth certificates, but not those unlucky enough to be born before, which covers thousands of individuals. You don't have to have a CT connection to adoption to make your voice heard! You don't have to be brilliant to write a note and let your feelings be known! Just do it! After having been in this battle for decades, and listened to judges and attorneys (often adoptive parents themselves) and agency owners say that unsealing records will lead to "disaster" and other horrible repercussions, the Academy of Adoption and Assisted Reproduction Attorneys in January passed a resolution stating that it supports the "inherent rights of adult adopted persons to have their personal biological family information," which includes access to not only their original birth certificates but also their agency and court records which related to the adoption. Massachusetts and New York also have bills in the process, and they too need your immediate support with letters and emails. You do not have to live in the state, or have relinquished your child, or be adopted in either state to make your voice heard. Massachusetts' law is even stupider than that of Connecticut's for it denies adoptees born in the 33-year “gap” period between July 17, 1974, and Jan. 1, 2008, access to their own original birth certificates. New York is the most neanderthal in the OBC regard: laws passed in the Thirties sealing records of all adoptees still stand, so there is no gap generation that legislation needs to correct--it needs to fix the whole damn thing! We thought we might have been close last year, but then strong opposition from the same lawyers and judges and legislators who have been around for eons continued to muck up the progress and so, basically, we are no better off here then when I surrendered my daughter in 1966. We have good bills in New York, now in a legislative committee to work out a final draft. We are all holding our breath so that it does not come out with a redaction veto, or the complicated and cumbersome language of a bill that stank (and was not signed by Gov. Cuomo) last session. I got around the rules by hiring an anonymous searcher in 1981 for $1200 (around $3,400 in today's dollars) had my daughter's name, address, parish and phone number in a short time. (The individual, I learned, had already found her from the clues I left in my memoir, Birthmark . Within days I made contact with her adoptive parents, as my daughter was 15, and her ten minutes later, and a few days after that I flew to Madison, Wisconsin and met her and her adoptive family. We had some good times, we had some rocky times, but no one has ever doubted that our reunion and relationship with a psychological salve for both of us. 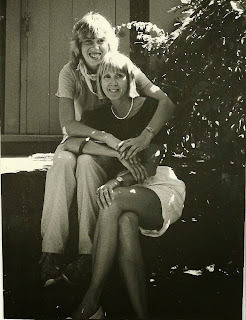 The photo above was taken the following summer, in 1982, on our porch on Long Island, New York. If you don't think we have come a long way since the days of Florence Fisher of ALMA, Lee Campbell of CUB, B.J. Lifton, myself and others arguing to open sealed birth certificates and be derided as loonies who would unleash havoc into the world, you don't know the history. It was bad, but we knew we had right on our side, and so we persevered. I'm including a copy of the note I wrote and sent to Connecticut below as a sample, but write in your own words. I hadn't realized fellow blogger Jane had already written (also below), and our letters are up and public and our two letters couldn't be more different. But they make the same point: Give all adoptees their original birth certificates. Short is good, but if you feel that you must write your heart out, say what your overall reason for writing is upfront. Because there always seems to be a legislator that pops up and asks--demands--that mothers be given an absolute veto to the release of the information--which is just wrong, anyway you look at it--do mention that no one should be able to control the information given an individual about himself. Allowing mothers or fathers (if named, usually not) the veto to redact their names gives them the right to control the lives of others in the most iniquitous of ways, all under the guise of some phony protection for mothers in the closet. We are well past those days of protection, just as we are past ladies carrying smelling salts in their purses should they feel faint. Having trouble making these link. Just copy into your email. Massachusetts: Call, e-mail, or tweet your MA representative and senator, If not a resident, contact the Speaker of the Assembly, Robert DeLeo and Senate President Harriette Chandler or write to them at 24 Beacon St., Boston, MA 02133. Please allow all women and men to have the right to answer answers to the questions that most individuals have as a birth right: Who am I? Who was I when I was born? What is my story? Who is my natural mother? What is my ancestry? What is my up-to-date family medical history? Refusing this right to those individuals is legally akin to allowing some slaves to be free, others still held captive. One tenet of freedom is the unhindered ability to make certain decisions about one's own life and identity. Yet ignoring common sense, legislators from another era took this right from the adopted without full consideration of its lifelong psychological impact. The laws were wrong and unjust when they were promulgated, and they are just as wrong and unjust today. Before DNA testing, men charged in paternity suits were not allowed to hide under a cloud of anonymity because it might embarrass them, and today women should not be in such a privileged status. To allow them this Victorian-era protection is prima facie wrong, immoral and unjust for it continues to violate the rights of another class whose only difference from the rest of us is that their mothers could not keep them, for whatever reason, and consequently these children were adopted. I write as a birth mother who relinquished a child in 1966. We were reunited in 1981, and had a mutually satisfying relationship that included her adoptive parents until her death in 2007. Her daughter, my granddaughter, is an art teacher whose connection to her mother's extended adoptive family is tenuous, and I am the connection to her biological family--cousins, aunts and uncles who she knows and considers family and calls upon them as friends and a family resource. As a side note, my family--my granddaughter's family--is rife with artists, art directors and graphic designers; the other family has none in the field. Our story is but one; yet there are millions of others like ours. To be fully free and equal individuals with all of humankind, all should have the right to know their own stories, whether adopted or not. No one should be denied their ancestry because it might embarrass another. I have been involved in this issue for decades, and have written about my experience and involvement in numerous national publications as well as written two books. (hole in my heart and Birthmark), and write at firstmotherforum.com. I have testified in court and before a Senate committee in Washington DC, as well as in Albany, and frequently been interviewed by the media. I will be happy to answer any questions or supply research on a subject in which I perforce became an expert. Do the right thing! Lift that last barrier in Connecticut and give all adoptees the right to own their true identities! In 1998 Oregon voters passed a ballot measure granting adult adoptees the right to access their original birth certificates. I along with over 900 first mothers appeared in a full page ad in the Portland Oregonian in support of the measure. It passed with 57 percent of the vote. With the encouragement of adoption attorneys, five first mothers filed a court action seeking to have the measure declared unconstitutional as a violation of privacy. The Oregon trial court and the Oregon Court of Appeals rejected the claim. The Court noted that delivering a baby is inherently a non-private act. The U. S. Supreme Court denied certiorari and the measure went into effect in January 2000. Thousands of adoptees have received their birth certificates. Many have joyfully reunited with their first parents. In 2013, the Oregon legislature passed a measure allowing adult adoptees to access most of their court adoption file. The measure also allows natural parents who placed their children for adoption voluntarily to access documents in the court file which contain the adopted name of their child and the names of the adoptive parents. This has allowed mothers to find their lost children and help them to begin healing from their loss. There have been no reported problems with these laws. I urge the Connecticut Legislature to join the 20 plus states which allow adoptees to obtain their original birth certificates regardless of the year of their birth. A quick read that takes you down the road to using DNA. A useful tool. Block Louisiana SB392. It is a poorly written bill that requires adoptees to go through the registry which requires psychological counseling, has disclosure vetos available to both parents and siblings to prohibit release of a birth certificate, an adoptee has to have permission from his parent to get anything and that parent would have been in the registry and have no veto on file for an adoptee to get his OBC. It is a huge step backwards for Adoptees in Louisiana. This is the worst bill I've ever heard of.